With the holidays here the shopping has commenced. Parents, grandparents, aunts, uncles and friends are busy trying to find good, quality toys to give as gifts to the children in their lives. As a pediatric speech language pathologist, I happen to be very passionate about this subject. I am a firm believer that PLAY is at the core of our children’s overall development, especially when it comes to speech and language development. Play is the work of children and much of children’s play revolves around the toys they have available to them. Sometimes the best “toys” are not toys at all! To read each tip explained in detail, check out the full post at the Friendship Circle Blog. Also, My friend Kim talks a lot about toys on her blog Little Stories as well, check out her post on Why Your Toys Need a Makeover…before the holidays get here a good clean up is a great idea! You’ll notice I say ditch the batteries and skip the ABC’s and the 1-2-3’s. What I am referring to, are those plastic, light up “educational” toys. I talk all about those in another post but Kim from Little Stories also talks about these SCLANS and how these “educational” toys are not so educational after all. So what DO I recommend then? 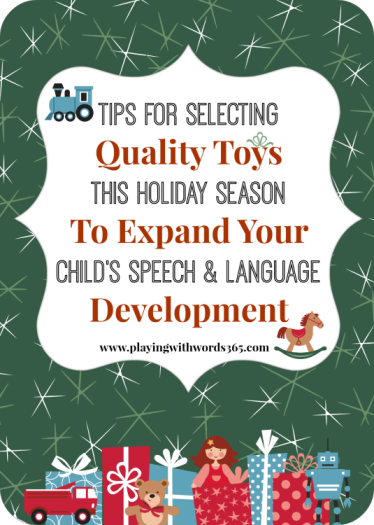 Tomorrow, I will be sharing my top 25+ gift ideas to help expand you young child’s speech and language development! You’ll see that I follow my tips above and recommend many of the brands I mention as well. Until then, I thought I’d share some of my favorites. Some of my favorite toy brands that generally follow my guidelines include Melissa & Doug, Lakeshore Learning Toys , Plan Toys and Fisher-Price Little People Sets (sometimes these include batteries…most of the time I remove them). Little Tikes makes some good outdoor toys including ride on cars as well as some great play kitchens (ours is Little Tikes) while LEGO Duplo makes great building toys for toddlers.Green Toys also makes some good quality, open ended toys as well. As far as where to shop I do a lot of shopping on Amazon (we have PRIME) but I find a lot of GREAT deals on AWESOME toys at Ross, TJ MAXX, Marshalls, and Homegoods from MANY of the brands I listed above! Check back tomorrow for my toy recommendations! Until then…tell me, what are YOUR favorite toy brands? Kara recently posted..Ultimate Gift Guide for Sustainable Giving! Aren’t gender roles funny? My son loves to “cook” in the kitchen….just like his daddy 🙂 So glad you enjoyed the list! Thanks for this Katie. My nephew asked me yesterday what I thought about littles using iPad apps. I’ve seen some great apps, which my grandson uses, so I said sure, in moderation. However, my nephew and his wife focus on what you suggest and their kids are exceptional with language skills and understanding. I think I will send him this post. Yes, you won’t see iPad apps tomorrow ;). iPad’s have a time and a place (we have one) but I am not a fan for toddlers with language delays with the purpose of increasing language. Love hearing about your nephew and his wife! Not a brand per se, but I’m usually fond of anything Waldorf or Montessori-ish. 🙂 I do love Melissa and Doug and Lakeshore, too. Can’t wait to see your recommendations tomorrow! Me too! My daughter goes to a Montessori preschool, love it! The best toys aren’t really toys- I gave a huge box, that I cut windows and a door into, along with stickers, markers and finger paints, to a friends son, and I still hear about it years later! Interesting tips for selecting toys. I agree that some electronic educational toys are not really educational, however I think some depend on whether they are for motor development, physical development, speech development, etc and what your child needs most. Primary Beginnings put together a list of educational toys for toddlers that I thought was quite good. One toy was electronic, but its brain training abilities can benefit children long-term. Hi there Lauren, thanks for stopping by. I do not believe we need talking and light up toys to “train the brains” of our children. In fact, several companies that have made toys and programs to “train the brain” of young children have been sued and LOST because their products do not provide educational value (including “your baby can read”). This post is about picking quality, open ended toys to allow a child to play, discover and learn within natural play experiences. There is a time and a place for some electronic toys, however most of the plastic, talking, light up toys “do” too much of the “doing,” provide closed ended activities, and entertain rather than educate.